I am blogging this über healthy recipe to counter balance the very indulgent ones we have been sharing recently. We seem to favour cakes and all manner of sweet, and may I add unhealthy, delights on our blog but not as many main courses (meat/fish, etc). I wonder why that is. Anyway this particular dish can’t be accused of being “bad” for you or fattening so here I am promoting it to our little group of foodie friends. An interesting thing to report here is that I had NO idea what the Italian word for sea bream was when I embarked on the idea of cooking it. I had had sea bream in restaurants before, of course, but had no idea what the Italian word for it was. In truth something linguistically very peculiar has been taking place with fish ever since I moved to this country many many years ago. Namely, I know the English- Italian translation of many bog standard fish (like salmon, trout, sole, cod, etc.) but navigate a little further afield (in the world of the sea bream, sea bass, red snapper and such like) and I’m totally and utterly lost. Clueless in fact! I know the Italian name of a certain fish (which doesn’t mean I KNOW what the fish looks like, you understand), I know the English name of another fish but can I pair them up? Can I hell!! Mind you some fish only exist in the mediterrenean sea, so you wouldn’t find them in the North sea, and viceversa (that’s my excuse). ANYWAY, to cut a long story short, I’ve discovered that the sea bream is none other than the “orata”. How cool is that? It only took me all this time (and it’s a LONG time, trust me) to bother to work it out! Am I sad or what?? 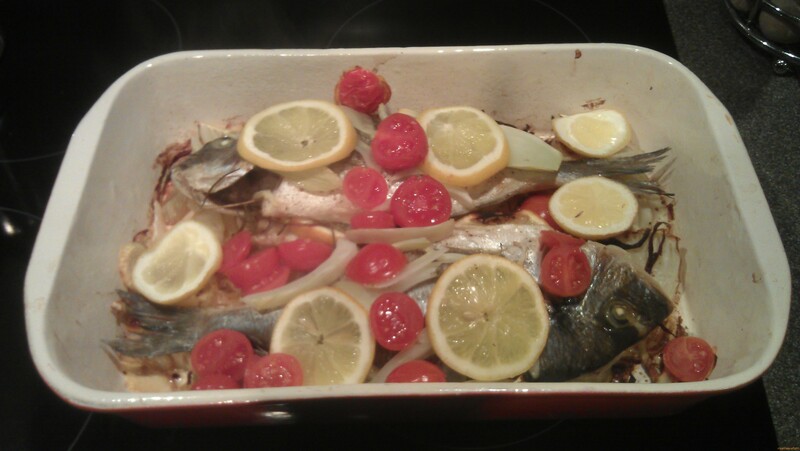 I had actually never cooked sea bream before but I must say I’m rather pleased with the result. I had to scour the internet for a recipe. There seem to be many similar ones out there. Fennel apparently goes very well with sea bream. Anyway, in the end I settled for this one which I found on La cucina italiana magazine online. Wash the fish, and pat dry. Season them with salt and pepper, then place a rosemary sprig and 2 lemon slices in each cavity. Oil a largish baking dishes. Place the onions and all but 2 slices of fennel in the bottom of it. Arrange the fish on top, and drizzle with olive oil. Bake for 20 minutes at 190 degrees, then remove, and top each fish with the tomato slices, remaining lemon slices and the reserved fennel. Return to the oven for another 10 minutes. 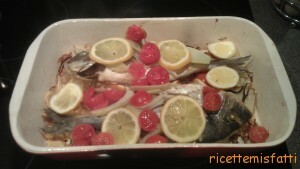 To serve, spoon the vegetables onto 2 plates, and place the fish on top.